← Celebrating Endangered Species Day! Endemic and Endangered: Stories of a frog and a tanager. In the human world, we select people to represent our countries, our towns, our villages, our communities; it is similar in the animal kingdom. A flagship species is an ambassador for a specific habitat and normally conservation of that species or the area they inhabit has benefits for other species. Here in the Osa Peninsula, we are home to a staggering 2.5% of the planets biodiversity, living on a mere 0.00000085% of the earth’s total surface area. Now that’s impressive! This biodiversity includes many iconic, endemic, and endangered species, which are ecologically important to this region. Here are 7 of the most interesting and exciting examples you might find during your visit to the Osa. This beautiful yellow-bellied sea snake can be found in the temperate waters of the Golfo Dulce. Its physiological adaptations allows this species to become boat-like, with a tapered belly similar to the keel of a boat providing stability in water, along with a flattened and broadened tail, which performs like a paddle for swimming…this is the Michael Phelps of the snake world! The Yellow-billed cotinga is an endangered bird whose small population occupies only a tiny area. There are estimated to be 250-999 individuals, and only 150-700 of them are mature. They occur in mangroves, lowland forest, scrub, and occasionally in isolated trees in nearby clearings. After completing a radio-tracking study to understand their habitat uses for breeding and feeding, Osa Conservation is now focusing on protecting this land through the creation of a reserve. Mangrove hummingbirds are another vital species in the mangrove habitat. They feed mainly on the flowers of the tea mangrove and are the only birds that have adapted to collect nectar with a specialized tongue. 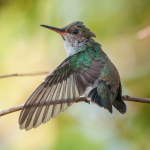 Their diet of carbohydrate-rich sugar nectar is necessary to support the hummingbird’s significant energy demands, as their wings beat 200 times per second. They will feed on between 1,000 and 2,000 flowers each day, allowing the tea-mangrove flowers to maintain high pollination rates. We are in the midst of starting a new project to protect the mangrove habitats here in the Osa. Populations of White-lipped peccaries are decreasing due to hunting and habitat degradation and fragmentation. Consequently, this species is now listed as vulnerable. Records indicate that they can form groups of as few as 5 to as many as 200 individuals. In conjunction with the wildcat program, Osa Conservation will be radio-collaring and monitoring the peccary population, as they are essential prey for large cat populations. Green turtles, listed as endangered by the ICUN, are one of the many sea turtle species that come to nest here. It is hypothesised that the hatchlings leave the nesting beach and begin an oceanic phase by floating passively in major current systems, which serve as developmental grounds, after several years. They then proceed to seagrass and algae-rich areas where they forage until maturity. In the Osa, we have the Golfo Dulce, which is rich in these foods, and we monitor Playa Peje Perro, which is considered an important beach because of its high population of nesting female green sea turtles. Spider monkeys are energetic and agile movers found high in the canopy. Recorded as endangered on the IUCN Red list due to hunting, pet trafficking and habitat fragmentation, spider monkeys are in dire need of protection. Osa Conservation works hard to protect their areas of habitat, including important corridor routes surrounding national parks, and restore other aspects of their habitat. Spider monkeys are typically found in groups of 20-30 individuals, but often split up during the day to forage. In the evening, they all return to a specific “sleeping tree” to be together as a big family. The Golfo Dulce poison dart frog is yet another species affected by habitat fragmentation and degradation, both of which have caused it to become endangered. As an endemic species here in the Osa (meaning it is only found in this region), this species is all the more special! Females deposit eggs on leaves above the ground, then the males carry the hatched larvae to small pools where they complete their development – a true team effort. These are just a few of the many wonderful and magnificent species you can find here in the Osa Peninsula that we are working to conserve by protecting and restoring their habitats. These are just a few of the amazing species we can appreciate as we celebrate World Biodiversity Day!